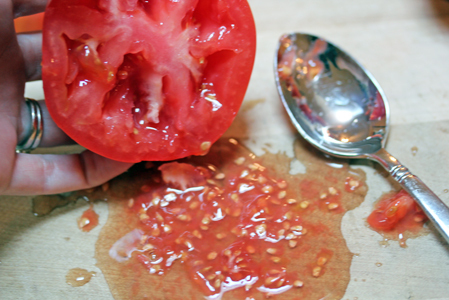 If you need to use a tomato without all the drippy, seedy parts, try this quick and easy way to remove the seeds from the tomato. Simply slice the tomato along it’s equator, then gently squeeze out the seeds. By slicing longways, the seed pods should be broken and should fall out easily. The seeds from some varieties of tomatoes might not fall out so easily, so gently nudge them with a small spoon to encourage them to fall out. 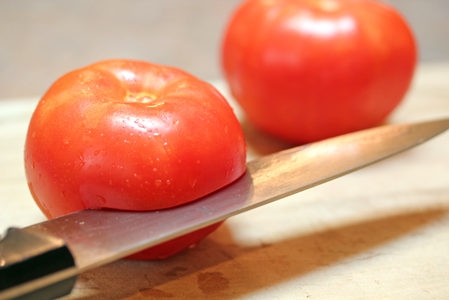 Then slice or chop your tomato as needed! 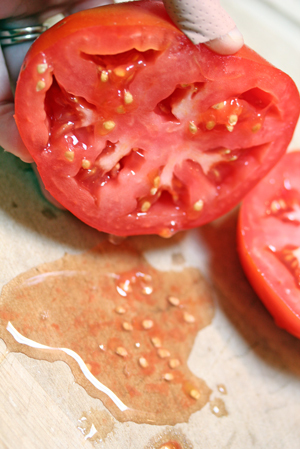 What way have you found best for seeding tomatoes?! You’re so polite about it. I just shove my fingers in there over the sink and rip them all out when I seed tomatoes. Maybe I need to go to Cooking Charm School. I’m apparently a little crass in the kitchen. Erin, your how-to posts are so helpful. Thanks Heather…I appreciate you sharing that! I agree with Deanna. I use my finger, it’s quick and easy.